I decided to get some work done in the Hangar today, my home schedule has been pretty busy with flying and spending time with my girl since she is in town for an expo downtown Chicago. 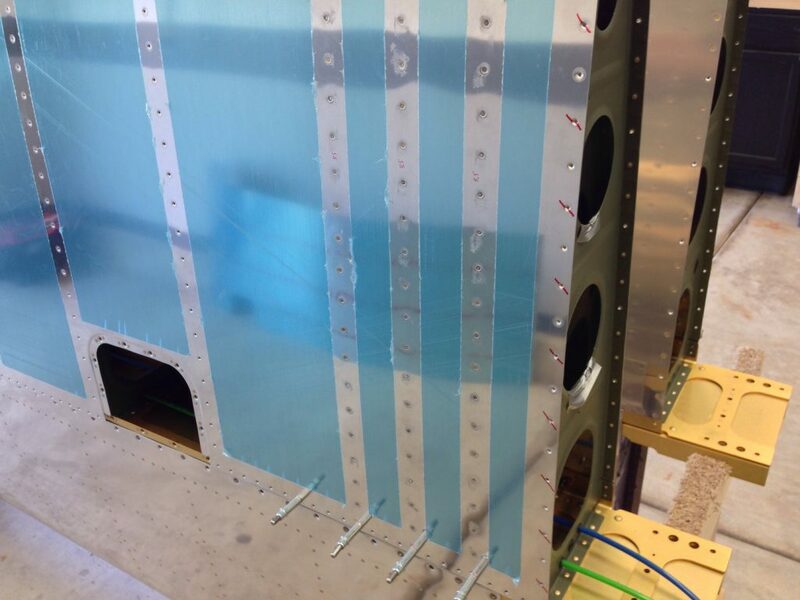 My next big task is to get the inboard bottom wing skins riveted on. 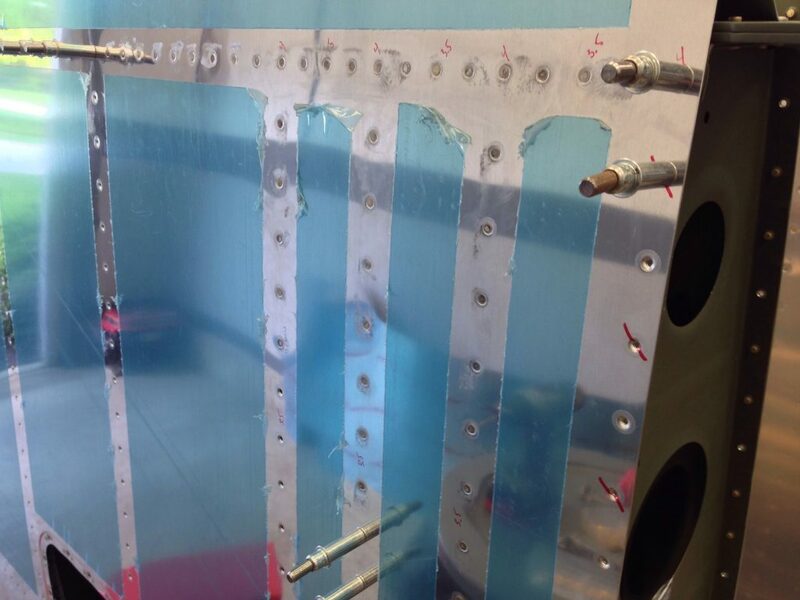 I have been dreading this task as it is very hard to get inside the wing to buck the rivets. Before I could start I needed to scarf the joint where the inboard and outboard skins overlap just as I did for the top skins. I’m working on the left wing today as I knew that trying to get both wings done would be nearly impossible lay the same time. Once I was happy with the overlap I checko’ed the skin to the rear spar and no where else. 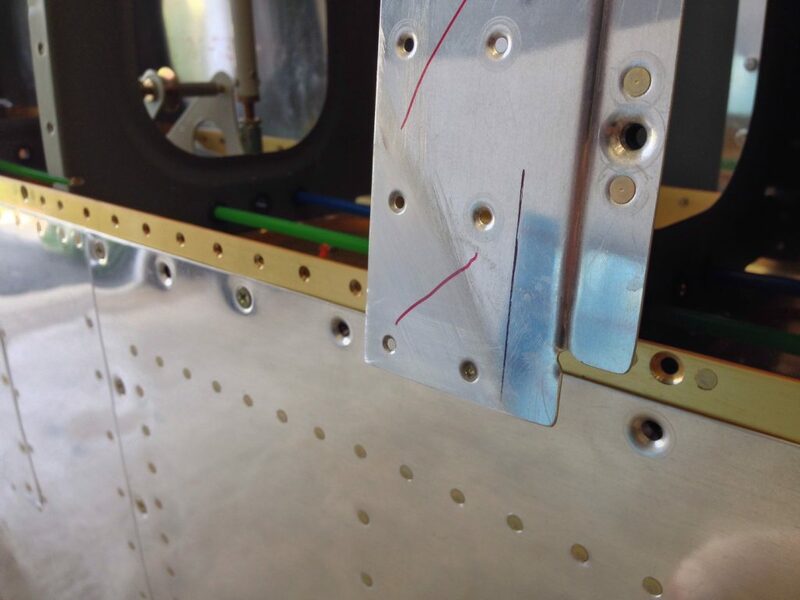 I need to be able to lift up the skin at the forward end to slip my hand and bucking bar all the way into the wing to get to the rear spar rivets. This is a lot of work and very difficult especially between the wing walk ribs. I worked from inboard to outboard on the rear spar rivets until I was outboard of the last wing walk rib. I then went back and went aft along the second inboard rib (the first I will get with the squeezer later) for 4 rivets. I moved to the next rib outboard and went down 2 rivets. Moving back to the first rib I added 2 more rivets followed by 2 more on the 3rd rib. I then went to the 4th rib and did 2 rivets. Can you see the pattern? I was stepping the rivets as I worked outboard. It took me 1 hour to get 43 rivets done as this is very difficult. I have to use a mirror and flashlight just to inspect the quality. I have had to drill out 2 so far as I let the bucking bar slip I guess. I finished up all the wing walk ribs and decided that I would stop there. I had a meeting to attend then off to dinner downtown with my girl. I have read that these rivets take a while since they are so hard and I don’t want to push it. The rest if the week and weekend will be shot for hangar work as it is the Memorial Day weekend. After that I will get back hard at it.